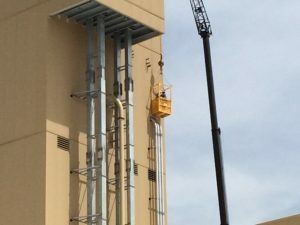 Building maintenance services are an important part of keeping your metal building protected from nature’s corrosive elements. Avoid costly repairs with a maintenance plan that will fit your needs and budget. The key to a successful maintenance program is to start before you need costly repairs. 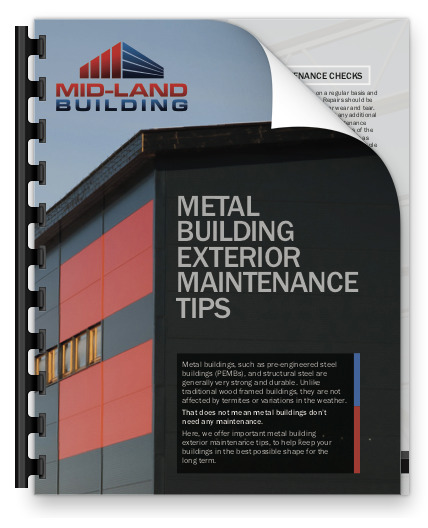 Metal buildings are the lowest maintenance structures you can buy, but they aren’t totally maintenance free. Metal can become damaged and require patching, sealing, or other care to ensure long life. If there is existing damage, we can provide an estimate for repairs. Then we can discuss your options for a solid maintenance plan. As part of the Mid-Land Building Division, we service and repair existing buildings and structures including roofs, walls, penetrations, trims, gutters, doors & overhead doors, windows, and any other areas needing attention. We are here to help or design a program for you. Please give us a call to discuss your needs.